I have been gone awhile and I apologize. I have been REALLY sick. Let me give you an example of HOW sick I really was: I didn't stamp for an ENTIRE week. If you know anything about me, you know I stamp almost daily. Yesterday was the first day I actually stamped something in over a week. I was coughing so much (and still am coughing) I took an entire week off work (which I haven't had to do yet as a teacher... there's always a first). I am going back to work this morning so some prayers for less coughing would be appreciated. I am still really congested and have been told the virus just needs to run it's course (could be weeks they said). Exciting, right? WRONG! Anyway, I am back! I have been wanting to join some challenges "for fun" lately and this is one of them! I love this color combination and was excited to play with the elements! I did add some silver glimmer paper to add some sass but I think it really brings this card together! I hope you enjoy this card as much as I enjoyed making it! 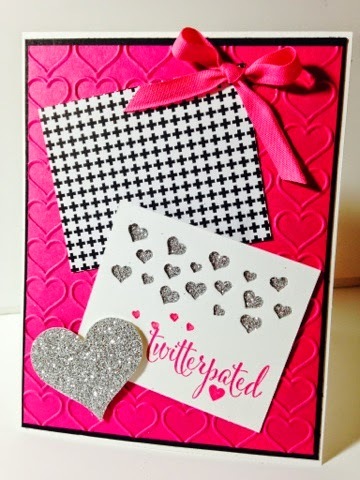 Don't you just love that heart embossing folder?! Super cute card Pam! I love all of sparkly hearts! Thanks for playing along with us at HSS! Super cute card! I do love the hearts embossing folder. It's one of my favs. You're right. The silver glimmer paper sure does add sass. Thanks for playing at Hand Stamped Sentiments. What a cute fun card! Love how you added some bling behind the punched piece. Thanks for playing with us this week at HSS!